Where you want the snowflake award! Cherokee High School Speech and Debate hopes you will consider joining us Saturday, December 1st at our first tournament: Cherokee Winter Challenge. Our team is honored to host you at the final forensics challenge of 2018 in the great state of Georgia! On Saturday, a variety of events will be offered. In debate, we will offer Novice and Varsity Public Forum (NSDA Nov/Dec resolution for both divisions) and Novice and Varsity Lincoln Douglas (NSDA Nov/Dec resolution for both divisions). Students registered in PF or LD cannot enter either pattern of individual events (IEs). IEs will run using a patterns system (please closely review our schedule). Students in IEs are encouraged to step up the Cherokee challenge by double entering in each pattern. Using this system, a speech student could participate in up to four IE events! However, please note, no double entry will be allowed in pattern B if a student participates in BQD due to time constraints. In student congress, if a student submits a piece of legislation by Tuesday, November 13th, to jamie.wills@cherokee.k12.ga.us by 7:00pm, his or her entry fee for congressional debate will be waived! We will supplement whatever legislation is received with the NSDA’s November legislation packet. We are also offering middle school events! We will have middle school big questions debate, impromptu, oratory (OO and INF combined), and dramatic performance (DI, HI, DUO). Students will have concessions available throughout the day and lunch options will be made available. A hospitality lounge will be available for coaches and judges. NO ONE should leave campus for lunch as we plan on keeping our schedule moving as fast as possible. 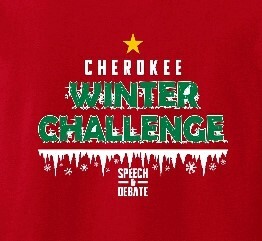 Cherokee Speech and Debate hopes you will join us this winter for an exciting tournament! Are you up for the challenge? Assistant Coaches: Sara Martin (interp), Leeanne Kline (oratory), and Jake Williams (debate). All events should follow NSDA guidelines, but where NSDA and GFCA guidelines conflict, the GFCA rules for events will apply. This is a GFCA sanctioned event. Registration and tabulation for all events will take place on www.tabroom.com. - Teams need to provide one judge per four Public Forum teams. Hired judges are $100 for Public Forum or a portion thereof at $25 per entry. - One judge for every four Lincoln Douglas entries. Hired judges are $100 for Lincoln Douglas or a portion thereof at $25 per entry. - One judge per five Individual Events entries. Hired judges are $100 for Individual Events, or a portion thereof at $20 per entry. Note – If a school can provide a congressional debate judge who can act as a parliamentarian, the school will be credited $100 to its invoice! Buses should drop off students in front of our new gym (after turning into CHS at the light, turn immediately right, then turn immediately left to unload students in the bus lane). Buses should then proceed to Cherokee North (to the right of CHS Main if looking at the new gym) and park behind Cherokee North. Cars – and any vehicles that can fit into a normal size parking space – should park in the spaces available in front of the new gym.